We help teachers, counselors, administrators and parents see students who are in danger of academic struggles — long before traditional at-risk indicators appear. Teachers are often very good at identifying students who are in need of additional attention, but every classroom has a student, and sometimes a few, who are simply hard to read. And sometimes those students don’t even know there is something wrong in their life — until it’s too late. Graduation Alliance’s Social and Emotional Learning tool, ScholarCentric, leverages more than 20 years of research on student resilience to break resiliency down into malleable skills that can be measured and developed within every student. 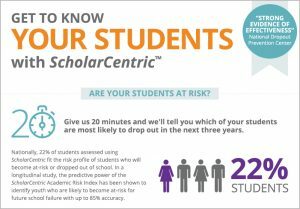 Further longitudinal research, correlating student performance on ScholarCentric’s Resiliency Assessment with academic performance over time, has demonstrated the ability to predict which students are most likely to become at risk — up to three years ahead of the acute symptoms students demonstrate before dropping out. But these tools don’t just help students who are, or will become, at-risk. They can also help identify students who can achieve at greater heights if only provided the right “soft skills” to do so. And the variety and depth of ScholarCentric’s resiliency data sets — from aggregate site trend data to individual student profile data — allows school teams to efficiently target tiered SEL interventions, and measure the impact of those interventions over time. From our ScholarCentric social and emotional learning intervention program — comprised of curriculum material for grades 6 and up, as well as pre- and post-assessments for elementary through high school — to our college and career readiness supplements, Graduation Alliance is helping ensure students have the soft skills they need to set and achieve goals, demonstrate empathy for others, maintain positive relationships, and make responsible decisions. That, in turn, makes them more hirable and promotable — no matter what career they pursue. The longer you wait to begin looking for critical social and emotional indicators, the harder the challenge of intervention becomes. Fostering resiliency in young students provides them with the social and academic competencies they’ll need to be successful in middle school, high school, and beyond. The ability to persevere in the face of challenges, understand the importance of education, deal with stress, and communicate feelings are critical assets for the 21st century student. ScholarCentric’s Elementary Resiliency Assessment for grades 3-5 evaluates students’ competencies in seven areas of resiliency that have been proven to impact academic achievement. 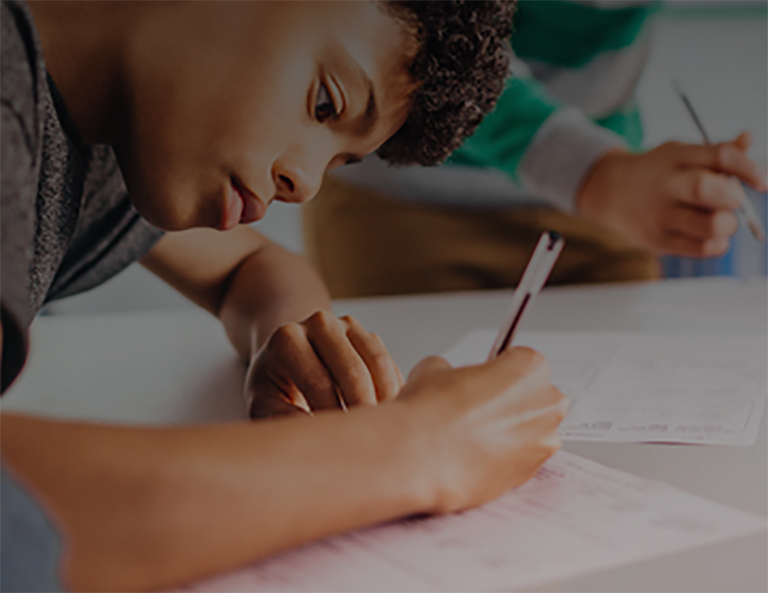 ScholarCentric’s elementary pre-assessment contributes critical data to form a more complete picture of the whole student and act to address each student’s SEL needs, and our elementary post-assessment provides a measure of how much impact interventions may have had on students over time. To learn more about our Elementary Level Tools, click here. Resiliency helps students excel in times of transition and stress. Middle school is a time of change. Academically, students face increased challenges and workload compared to elementary school. Social pressures increase and the physical changes of adolescence cause many students to experience feelings of uncertainty and doubt. Resiliency helps students to manage stress, reach out for assistance, and persevere in the face of challenges. Educators can gain leading data on how their students are handling the pressures of middle school using ScholarCentric’s Middle School Assessment, providing crucial insight into their students’ social and emotional skills and aptitudes, and leverage predictive analytics to identify students who are most at-risk of academic failure, permitting individual intervention and class-, school-, or district-level population interventions. To learn more about our Middle School Level Tools, including pre- and post-assessments and curriculum click here. Prepare students for college and career success. Resiliency gives students the capacity to meet challenges, adapt to change, and succeed in school and beyond. As students work to meet the demands of the Common Core State Standards, resiliency helps students to think deeper, problem solve, work collaboratively, and communicate effectively. Educators can assess their students’ resiliency skills using the ScholarCentric Assessment. This research-validated assessment provides invaluable insight into the social and emotional competencies of students and how these factors affect academic performance. To learn more about our High School Level Tools, including pre- and post-assessments and curriculum click here. One of the best ways to foster social and emotional learning development is through the framework of college and career readiness. That’s why Graduation Alliance’s college and career readiness programs are a key benefit to any school or district implementing a social and emotional learning program. ScholarCentric’s CCR Assessment allows school teams the ability to see which of their students are likely ready—or not ready—for college or a career, and identify specific skill areas of need, so they can better support their students and drive site CCR programming as students near high school graduation. By giving students a positive vision of life after graduation — making graduation an important waypoint rather than a conceptual destination — you can help students recognize the importance of developing resilience and other soft skills that will make them successful in not only reaching graduation but educational, career, and life ambitions much further down the road. To learn more about our CCR Supplements, click here. What if you could identify at-risk students even before warning signs appear? And what if you could get more students on the right path and keep them there? Don't just take our word for it, see the outcomes of ScholarCentric by reviewing five empirical efficacy studies.